Like Shakespeare and Coleridge, The Marion E. Wade Center values plots from the past—written by C.S. Lewis, J.R.R. Tolkien, Dorothy L. Sayers, George MacDonald, G.K. Chesterton, Charles Williams, and Owen Barfield—knowing that they can inspire new forms of creative expression. The Muriel Fuller Endowment for Imagination and the Arts was therefore established to celebrate artistic endeavors inspired by our seven authors. 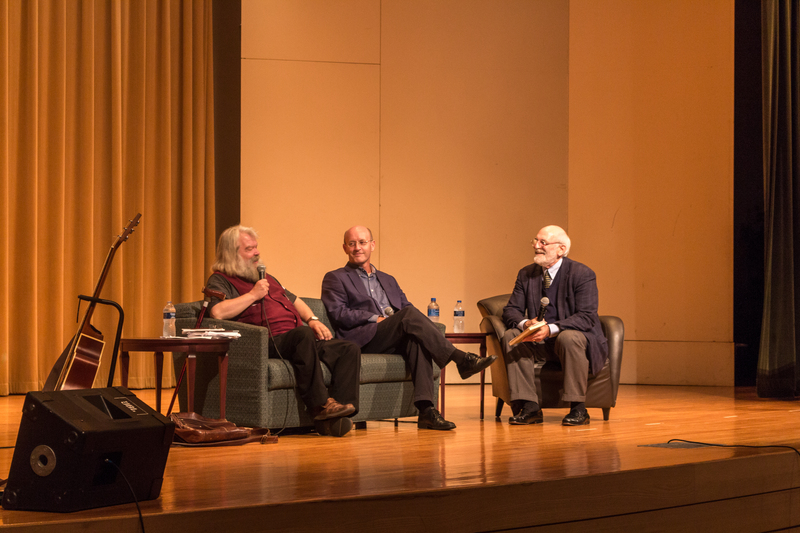 For the endowment’s inaugural event on September 25, 2018, we invited two British scholars, Dr. Malcolm Guite and Dr. Michael Ward, to reflect about the importance of the arts for communicating the Gospel. Chairing the conversation in Barrows Auditorium was Dr. Jerry Root, Professor of Evangelism and Director of the Evangelism Initiative at Wheaton College’s Billy Graham Center, which collaborated with the Wade Center to sponsor the event. Dr. Root reminded us of Lewis’s assertion that creative fiction enables writers and their readers to get “past watchful dragons” that prohibit new ways of thinking about Christian truth. Lewis, of course, got past watchful dragons by taking readers through a wardrobe in order to introduce them to Aslan. Malcolm Guite and Michael Ward in conversation with Jerry Root at the September 25 event. 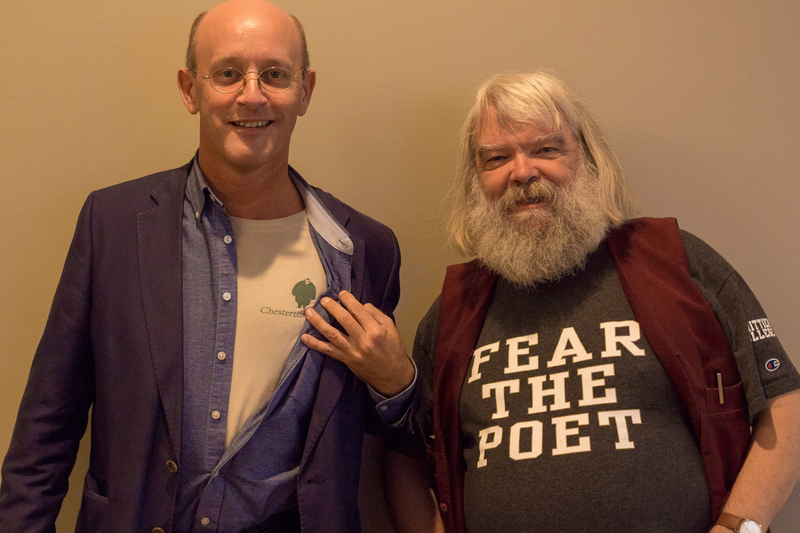 Michael Ward and Malcolm Guite showing off their shirt designs, which fit the “creativity” theme of the evening! Dr. Ward has become famous for glancing from heaven to earth and earth to heaven in his award-winning book Planet Narnia, which aligns the seven Narnia Chronicles with the seven planets. Having excited the imaginations of Narnia fans around the world, Dr. Ward reminded us of Lewis’s important assertion that there is no such thing as “Christian literature” just as there is no such thing as “Christian cooking.” Instead, to quote C. S. Lewis’s friend Dorothy L. Sayers, “Christian work is good work well done”[ii]—whether in the form of sonnet, soufflé, or scholarship. Both speakers demonstrated good work well done the next evening as they delivered lectures to an overflow crowd in the Bakke Auditorium at The Marion E. Wade Center. The evening was begun with a biographical sketch of Muriel Fuller by her nephew, David Fuller, who made possible the Muriel Fuller Endowment for Imagination and the Arts. Dr. Guite then followed by discussing the imagination of Coleridge before celebrating the artistry of Dante’s Divine Comedy, as well as Sayers’s exciting translations of Dante. Dr. Ward, Senior Research Fellow at Oxford University’s Blackfriars Hall and Professor of Apologetics at Houston Baptist University, followed with an overview of his argument in Planet Narnia, eliciting insightful questions from audience members. [i] Quoted in Crystal Downing, “A Rose by Any Other Name: The Plague of Language in Romeo and Juliet,” in The Ignatius Critical Edition of Romeo and Juliet, ed. Joseph Pearce (San Francisco: Ignatius Press, 2011), 165. [ii] Dorothy L. Sayers, “Why Work?” in Creed or Chaos? (Manchester, NH: Sophia Institute, 1974), 78.